"Clipping: term describing a conditon that occurs in amplifiers and mixing equipment where a signal is put through the equipment that is beyond what that equipment can handle. This results in a chopping off or "clipping" of the signal done to a manageable level, which off causes the loss of some part of the signal. Keeping a signal at a level of clipping for more than a few minutes will kick a amplifier into "protect" mode until it cools off." In short, it's a measure to stop sounds being so loud they go over the limit of the used recording/playing instrument. Another modern meaning comes from the sound in computers being coded in a way the volume can't go over a defined maximum value so any try to pass that value only end in that numerical clipping. The form of waves of the sound when it ends clipping is then cut giving the sound a buzzing -like if the speakers would explode- and unpleasant touch. Also, once the sound is clipped (with that flat ending you see in the picture) you can't lower the volume to fix it because that information above the limit (what became the flat zone) is lost. Mixing instrumental and vocals is one of the main actions that cause this problem. Let's say the sound is water inside a glass and if the water overflows then there is clipping. Now you have the instrumentals being water in a glass at 3/4 of capacity (3/4 of max volume, no clipping). And you have the vocals in another glass also at 3/4 of capacity (it's also ok, no clipping). But when you mix both in the same glass it's going to be too much and water is going to overflow (clipping). Finally some water is lost so you end having less liquid (the lose of information of the sound for the clipping). So, the sum of volumes of the instrumental and the vocal tracks can end clipping the final sound (the amplitude of the waves don't add like a direct addition in reality, but basically in normal songs the example is ok: "loud"+"loud"="TOO LOUD, there is clipping"). 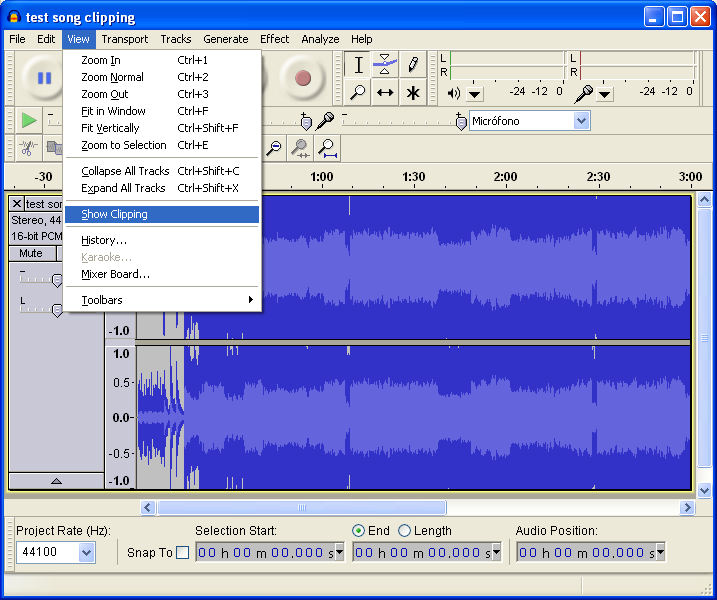 An easy way, without listening the full song, to see if there is clipping is using the "View->Show Clipping" option you can find with the last Audacity. Load the sound you want to check into Audacity. The clipping parts will be shown with a red line over it. 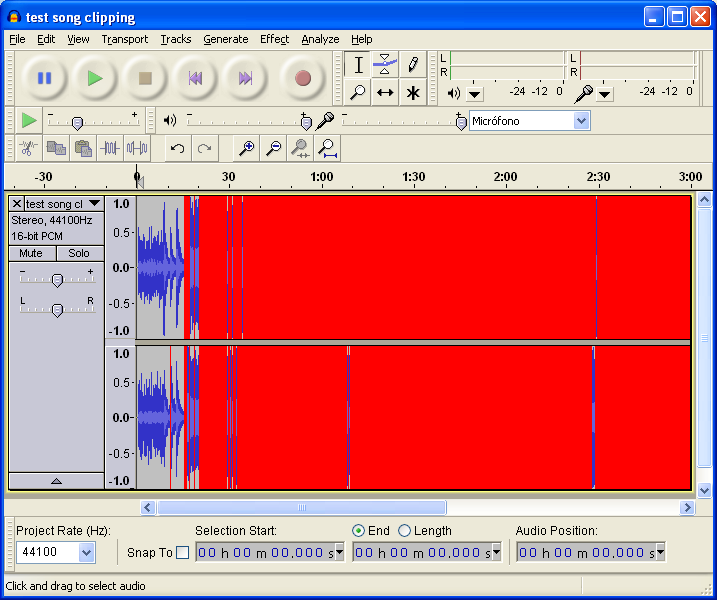 Audacity shows with vertical red lines the samples that has gone over the max. I edited the picture with soft blue lines what could have been the real wave but as the information was lost we will never know. Also take in count Audacity will show as clipping every sample that reaches the maximum but it can happen you actually want sometimes and exceptionally one or two samples into that red clipping zone for the sound being maxed. But that's just an exception and with three, at least, continuous samples clipping is surely making you lose information of the wave (and then losing quality of the sound). I personally know now two basic ways: "easy but simple" and "not that simple but professional". Just drop down the volume of both the instrumental and vocal track so when you mix you don't end clipping. In the example of the water in glasses, just think if your instrumental is water only filling 1/4 of a glass and the vocals is another 1/4 in another glass then when you add both the result will be 1/2 and that's way far of the overflow zone. This mix can sound too soft at the start but you can just always amplify it so it's nearer that maximum but you don't clip the sound with the final result. Here you can see a very basic tutorial for some tools you would use for this with Audacity. Reaper is very similar but with Reaper the next option may be easier to follow. 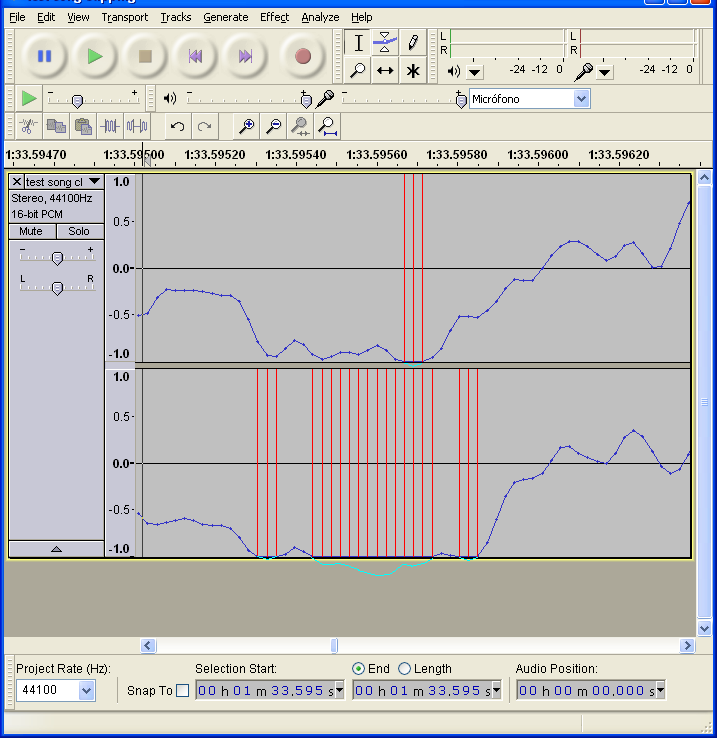 This method uses a tool called compressor. A compressor, in short, lowers the volume of too loud sound to the level of the softer zone so the end is more leveled and when you maximize the sound those previosly high parts aren't going to be a lot higher than those normal and not clipping zones. But instead of that complex (and probably with horrible English) explanation I would point you to this tutorial made by soaa-. That video explains very well how to use that tool in Reaper. Audacity also has this tool but the tutorials around aren't that awesome. Just check for yourself about tutorials in google or youtube. A pair of videos I found with basic but incomplete information would be this one as basic info on how it works or this pair about mixing audio that touches briefly the compressor tool. And that's what I know about avoiding clipping. Not much but I hope it can help a bit. I'm sure there are other ways so I will be grateful if you can post them or any help you can give about this issue while mixing. Re: Basic info about "clipping"
Ugh, yes, it took me forever to figure out that I was clipping like crazy when I mixed. Thank-you for this.